You are going to have cut the stalk back to about 2 inches, and repot it into fresh soil. 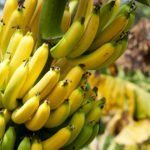 Bananas will get infections, almost, out of nowhere. You can prevent this in future by making sure there are plenty of drainage holes in the container, using a well draining mix, and making sure to only water when the soil is almost completely dry down to about 2 or 3 inches. This will prevent infections. It can be quite difficult to treat an infection once it starts, except to make the plant start fresh.